Exped Travel Wedge Plus I Bug Net. 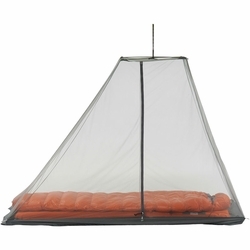 The lightweight 1 person mosquito net for outdoor use. The durable attached ground sheet seals the floor and keeps out all kinds of bugs. Two crossed poles in the roof increase interior space and the grey mesh offers unrestricted views. The Travel Wedge I Plus merges perfectly with an Exped Tarp II for sheltered nights out in bug infested country.